NETWORK UPDATE: The night’s rerun of THE GOLDBERGS was up 0.1 in final numbers, and the FAMILY GUY rerun slipped 0.1. CABLE HIGHLIGHTS: GAME OF THRONES came roaring back from last week’s decline, up a huge 0.88 to 3.45. (So much for all those people who claimed they were offended by the show to the point of turning it off.) That boosted SILICON VALLEY 0.14 to 0.98, but VEEP dropped 0.02 to 0.48, and LAST WEEK TONIGHT was at 0.62 after a week off (up 0.12 from 2 weeks ago). On Showtime, PENNY DREADFUL gained 0.06 to 0.30, NURSE JACKIE dropped 0.05 to 0.17, and HAPPYISH fell 0.06 to 0.09. AMC’s season premiere of HALT AND CATCH FIRE was at 0.21, which didn’t suggest any groundswell of enthusiasm had formed during the off-season, but was slightly better than the August 2014 season finale. The 2d night of MARILYN: THE SECRET LIFE OF MARILYN MONROE (Lifetime) was up a tick from Saturday at 0.51. SALEM (WGN America) remained at 0.13. 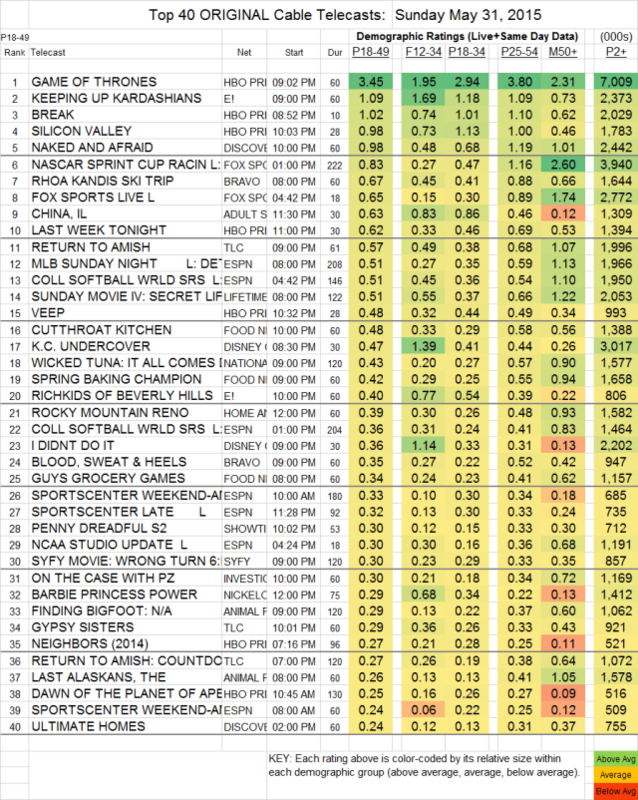 Adult Swim’s CHINA IL jumped 0.17 from its last episode 2 weeks ago to 0.63. On the unscripted side, E!’s KEEPING UP WITH THE KARDASHIANS climbed 0.24 to 1.09, and RICHKIDS OF BEVERLY HILLS gained 0.03 to 0.40, with THE GRACE HELBIG SHOW at 0.14. NAKED AND AFRAID (Discovery), which didn’t air last week, was up 0.04 from 2 weeks ago to 1.02. Bravo’s REAL HOUSEWIVES: KANDI’S SKI TRIP (airing at 8PM instead of 2 hours later) leaped 0.39 to 0.67, and BLOOD, SWEAT AND HEELS was at 0.35, with FASHION QUEENS at 0.23. RETURN TO AMISH (TLC) was at 0.57, preceded by a COUNTDOWN hour at 0.27. The CRITICS CHOICE TELEVISION AWARDS (A&E) was at 0.12.